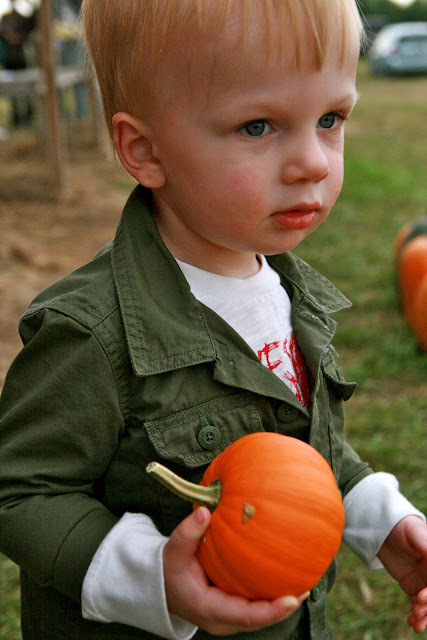 The one thing that I wanted to do this weekend-take the kids to a pumpkin patch. Easy enough, right? Wrong. After hitting up Brett's football scrimmage and a little Chick-fil-a, we started our adventure. My mom was nice enough to print out all 52 pages of information on the Missouri pumpkin patches. We scanned for SW MO and found one that was calling our name. It had pedal bikes for kids, pumpkins in the patch and already picked, goats that climbed "mountains", a pond, a kiddy maze crawl and more. This was going to be great and certainly worth the 30 minutes in the opposite direction that we were driving. Upon pulling up we noticed two vehicles but NO customers! The goats, well their mountain sure looked a lot like a dog house and the pond was a horse tank. We pulled in but instead of putting the car in park we pulled it to reverse and headed out the same way we came in. Do you think they saw us? The next pumpkin patch on the list was about 15 minutes away and luckily on our way home. As we followed what seemed to be 20 different pumpkin signs and drove another 10 miles away from the highway we saw it. Tents and cars and PEOPLE! This one may actually be worth the stop. We pulled up and noticed that there was plenty for Kaden to do so we quickly unloaded and we started our adventure. Vendor after vendor lined the old gravel road and Kaden of course stopped at each one until something in the distance caught his eye. A train, or at least what looked like a train and it was giving rides for $1. Grandma Sara instantly said she would pay a dollar for him to ride but I really didn't think it would be needed. He would get up there nice and close, sit in the seat and would want out. He surprised me. He walked right up to the line, took his seat on the hay bale next to the boys who were waiting and then handed the lady his dollar. He picked out the white barrel and I hoisted him in. He was actually going to do this. The lady started it up and away they went but ten short seconds later it had stopped and Grandma Sara was racing to rescue her scared little grandson. He got farther than I thought he would and once he was back in his safety zone he went back to admiring the train. He didn't want to get back on but he sure liked watching. After prying him away from the train we made a quick stop to pick out pumpkins. He picked out one for himself and one for Logan. Both perfect. We scouted out the pond-of which was a real pond, small but real-and got to watch a couple frogs jumping in off their lily pad. 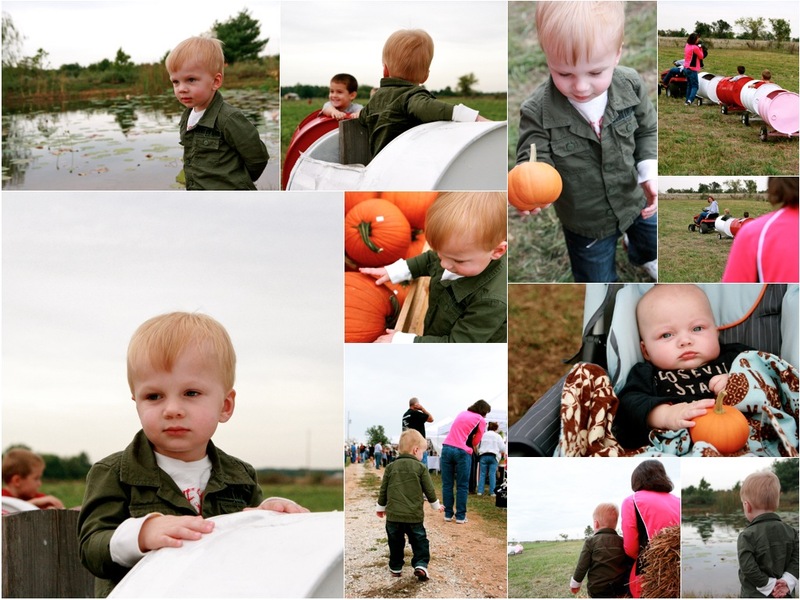 Once we had made our way around the entire pumpkin patch we headed home to Grandma and Papa's. The pumpkin patches don't hold a candle to the ones found here in Kansas City but Kaden still had a smile on his face-except for the train incident-and we still created memories. After all, thats what it is all about.